Summer: The best time for great swimming pool games! It is that wonderful season when human beings turn amphibious for three to four months. Parties migrate outside and congregate around large bodies of water, usually made by man for the purpose of staying cool while having fun. What better way to spice up a pool party than with some great pool party games? As a rule, the better swimming pool games involve physical activity. As the swimming and splashing increases, so does the laughter and fun. Just remember that the water should stay inside the pool. Two sports that adapt well to a pool are Volleyball and American football. One only needs a small football for a pool-sized version of American football. Teams should be three to five people each and stick to touch or flag football rules. Use passing plays instead of running plays and try to touch the football to the opposite wall to score points. 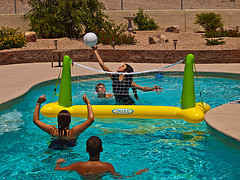 Volleyball should also use small teams, but the ball can be as big as you'd like.The lighter and bigger the ball, such as an inflatable beach ball, the more fun you'll have. Just string a rope across the middle of the pool and start smacking the ball back and forth. Lighter balls also don't hurt when people get conked in the head. Tag is perhaps the easiest swimming pool game to play since all you need is a group of people and you can play anywhere. Tag in the pool is especially fun. Two classic tag games for the pool are Marco Polo and Sharks. In Marco Polo, the player who is "It" is blindfolded and stalks his or her prey through a makeshift version of sonar. We shall call him Marco. Marco calls out, "Marco!" Everyone else responds with, "Polo!" It is bad form to stay underwater and not be able to hear or respond. Only cheaters do that. Don't be a cheater. Once Marco makes the call he tries to tag someone as everyone else quickly scrambles out of the way. It's okay to go underwater to get out of the way. Just don't stay there, you cheater. The first person tagged becomes the next Marco and takes the blindfold for a new round of the game. Shark is almost opposite from Marco Polo in that the person who is "it" is now the one hidden. We shall call him the shark. The shark swims about underwater searching for a victim. Just remember, you're not a real shark. Don't bite. That's almost as bad as cheating. You can play until the first person is tagged, but this game goes along quicker than Marco Polo. A better alternative is for each person tagged to leave the game. They don't have to leave the pool as long as they stay out of the way. The last person tagged is the winner and the new shark for the next round of the game. You can also play Marco Polo this way, but it tends to run on the long side. Other fun classic activities include races and diving for objects at the bottom of the pool. The latter usually involves some sort of prize. Everyone loves prizes. No matter what you play, keep in mind that accidents happen. There is always risk of drowning when immersed in a body of water. Muscles can cramp and heads can smack on the sides and bottom of the pool. Always have someone outside the pool supervising in case of injury, even when hosting an adult pool party. That person is also handy for getting snacks and drinks. With the proper safety awareness, everyone can have a fun time. To have all your friends join you for your pool party, be sure to prepare a great pool party invitation. Your favorite pool party Games!